For fifty years, the children of Palmer Home and Independent Presbyterian Church have gone to camp together, enjoying a week of fun and friendship. Today, Camp Palmer is held on the beautiful wooded campus of Camp Desoto on Lookout Mountain in Mentone, Alabama. Days are filled with traditional camp activities like hiking, horseback riding, archery, ropes, arts and crafts, canoeing, fishing, swimming, a climbing tower, Bible study, and games. Evening is time for singing, skits, and more summer fun, before settling down for the night in rustic cabins, breathing fresh mountain air and listening to the night songs of cicadas and crickets. Camp is open to anyone who has completed 1st grade up to 12th grade. Space is limited and filled on a first come, first served basis. 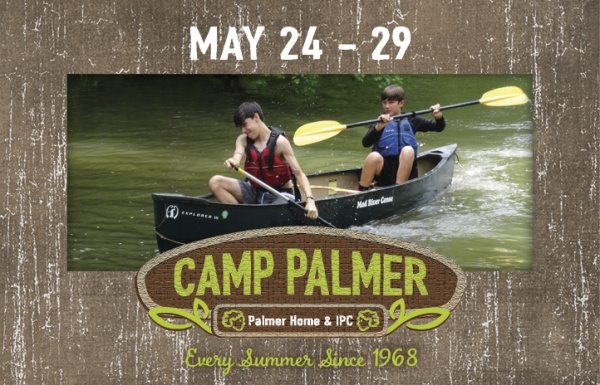 Please submit registration forms with payment (checks only); all forms, including camp application and liability releases for Independent Presbyterian Church, Camp DeSoto, and Higher Ground USA, should be deposited in the Camp Palmer mailbox located outside the Fellowship Hall or brought to the Children’s Ministry office. For more information, contact Lisa Turner at lturner@ ipcmemphis.org, or call (901) 685-8206. Check-in time: Friday, May 24, noon | IPC lobby | Depart: 12:30 p.m.
Return: Wednesday, May 29, 2:00 p.m.
Meet in the front parking lot for both departure and return. The only things provided for you at camp are a mattress and a bed. Please label all belongings (luggage, sleeping bags, pillows, clothing, etc.) with first and last name. Bringing electronics is highly discouraged. All electronics will be collected upon arrival at the beginning of camp and will be returned at the end of camp. Please label all items. Please be sure to mark your transportation needs properly on the registration form. If you need a seat on the bus, please circle yes. If not, please circle no and indicate how you will get to camp. This is very important. We want to make sure everyone has transportation to camp.